Today Samsung unveiled two new Galaxy Note phones, one that's a by-the-book upgrade to last year's Note 3, and one that that does something innovative and has the potential to shake up the way you use Android for the better. There's no official price announcement yet, but both phones will be out in October. Want to check them out sooner than that? Later this week the public in New York City, Chicago, Dallas, LA, and San Francisco will get a chance to at least play with demo models at select carriers. If you don't live in any of those cities, check out our hands-on below. Let's start with the more exciting one, the Galaxy Note Edge. So named because the screen wraps around one edge of the phone to provide a secondary display for things like quick launch apps or features, tools and settings, the weather, and more. Plus, it just looks really cool. Samsung gets points for coming up with a useful way to incorporate a curving screen in a smartphone that isn't just a rehash of a phone we've seen before (no copying the LG G Flex!). It also gets points for not just coming up with something gimmicky that dazzles in the display case yet fizzles in your hand. The edge display on this new phone has actual features people will appreciate, such as the ability to run simple programs like Timer or Stopwatch, display data like the time or an alarm and weather conditions. There are several ways to customize all of this, and with the release of the code for developers, soon there could be more fun and useful stuff for that narrow screen. The only worry I have is that wrapping the screen around the edge of the phone means greater chance of the screen cracking when it falls. Samsung didn't show off any cool cases specifically for the Galaxy Note Edge--though we assume there will be some at launch--so it's not that hard to imagine it slipping from the fingers. I also worry that in just holding the phone the way I normally do might accidentally activate apps I don't what it to activate. Knowing if this will be a problem will have to wait for the full review. 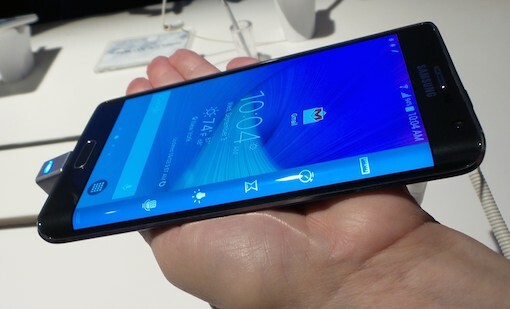 Aside from the cool curving bit, the Quad HD resolution display is gorgeous. Super AMOLED rarely disappoints, and the Galaxy Note Edge's is bright with popping colors and deep blacks. Plus the viewing angles appear to be wide. One thing I noted is that when I turned the brightness all the way down the screen went almost completely black instead of just very dim. That's likely a power-saving measure--I'd be interested to see if the screen is still visible in dark, dark rooms. All of that is the same for the Galaxy Note 4. In fact, the phones are identical except for curved displays. Same resolution, same processor, same cameras, same S Pen. 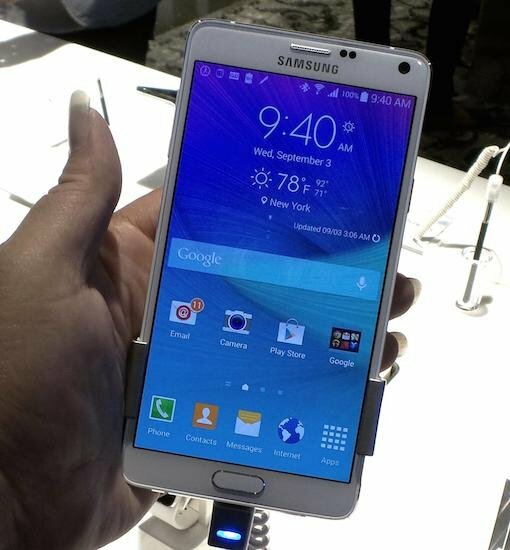 Yes, the Galaxy Note Edge is a Note, as the name indicates, and comes with a pen. More on that later. The Galaxy Note 4 is an incremental upgrade from the Note 3, which is an indication that Samsung feels it's mostly got the Note right, finally. The new generation is a bit taller than the Note 3, but otherwise shares the same general size, shape, and design accents. The 5.7-inch display is still the same physical size, but it has the higher Quad HD resolution. One thing to note design-wise is the flat edge that encircles the phone is made of metal. The back is still plastic, and removable, but there's now more metal in the overall design. In the hand, the Note 4 feels about the same as the Note 3. Still a two-handed device, but this is to be expected with phablets. The version of TouchWiz on the new Galaxy Notes is the same as what Samsung released with the Galaxy S5. During my short hands-on time it appeared to run just as smoothly and the overall look benefits from the bright, saturated colors the S AMOLED screen produces. You can still do multitasking with Multi-Window, which has picked up a few tricks from the tablet line. Now you can not only resize the windows and decide how much of the screen each takes up, you can make any compatible window a floating window of any size. This kind of thing works better on a bigger screen. I still like having the option. Samsung upgraded the rear and front-facing cameras. In back you now get a 16MP shooter with image stabilization that is supposed to take much better pictures in low light than its predecessor. The Note cameras have never been quite as good as the Galaxy S cameras in the same generation. However, this time it looks like there's more parity. In front, Samsung is taking a cue from HTC with a 3.7MP, wide-angle camera that can capture more people in one shot than before. Not so useful for Instagram, but nice that you can fit a crowd of people or more of the background in your selfies. There are no new S Pen tricks in this generation. The S Pen itself is now more sensitive. Otherwise, it's unchanged. This isn't a bad thing as the S Pen is one of the aspects of the Note that just works and doesn't need to be messed with at all. A few other features worth noting on both: the fingerprint scanner and heart rate monitor from the Galaxy S5 are here on these phones as well. Plus, there's a UV scanner. If you're running out of battery you can get 50% juiced in 30 minutes with rapid charging. And an ultra low power mode will keep the phone running for up to 20 hours if you're down to 10%. The new Galaxy Note 4 may not have a slew of wowgeewiz! new features and functionality to show off. That doesn't make it a non-exciting phone. If you are looking to upgrade from a Note 2 you'll be very impressed. Note 3 owners might not feel the need to do so. They may be tempted by the Galaxy Note Edge, though. This is where the real coolness comes in. However, as I said, some of the neat bits of the design worry me in terms of usage and durability. I'll reserve judgment until I get to do a full review. Still, the Note Edge is a very cool phone and I hope a harbinger of things to come.